According to an e-mail I just received, the pre-sale of tickets begins today and runs for 1 day only (until 10 p.m. tomorrow). Tickets can be purchased at www.harbourstation.ca or by calling 1-800-267-2800. Last edited by Elizabeth on Fri Jan 18, 2019 10:56 am, edited 1 time in total. The schedule, as of December 18th is available for download. The entries/start orders are available as is information about the live streaming, etc. Last edited by Elizabeth on Wed Dec 26, 2018 8:41 pm, edited 1 time in total. Great and thanks! I'm looking forward to watching this. Thank goodness we have this to watch during the post-Christmas let-down. Is anyone attending? Canadians has always been my favourite competition of the year. I won't get to go again for a while as I am saving up for Montreal in 2020 and still paying off house repairs. Oh to be like some retired teachers with 2 incomes...sigh. Will look forward to your in-person updates Elizabeth (if you are able to access the board). I notice on the entries for the Championships, that Gabby Daleman is listed as competing. Does anyone know if this is officially confirmed? It would be great to have her back on the ice again. Also, I see Stephen Gogolev in the Senior Men - but I thought I heard somewhere it would be a few years still, before he was eligible for senior ranks. Maybe I'm mistaken. For the first time in I can't remember how long, the pairs event will (should) be a cakewalk for championship. We really have been spoiled with so many great pairs teams throughout history. Gabby tweeted a week or so ago that she would be there - I guess that's fairly official I hope she is in a good place to do this. Steven began competing at the senior level in Canada last year. He just turned 14 so he cannot yet compete at the senior level internationally - one has to be 15 by preceding July 1st for that. I expect to see Moore-Towers & Molinaro win gold in pairs but who knows how the podium will look. I believe ice dance will be the most interesting competition with several teams vying for podium position, including the team that used to compete for Denmark. Teams for 4CC and Worlds will be interesting. GREAT! We look forward to your reports...that is if you have time. The Start Orders/Results tab and that for the Live Streaming of non-televised events are available there. Last edited by Elizabeth on Fri Jan 18, 2019 11:03 am, edited 1 time in total. Any idea if the times on the website are in ET or are they local time which is AT? I'm assuming the latter as it doesn't say. 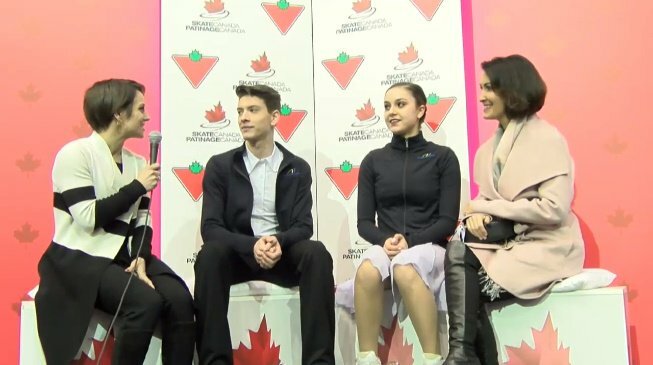 Novice and Junior competition began this morning - live streaming is available from Skate Canada with Ted Barton, Debbi Wilkes, Meagan Duhamel, etc. I got to the arena in time to see the last group of junior pairs and the remainder of yesterday's competition. My flight from Ottawa was delayed by about 45 minutes or I would have seen all the junior pairs. Not looking forward to the winter storm forecast for Sunday! Oh no about the storm!! I'm glad you got there safely...frustrating that you were late though. I've decided that for the next Nationals I attend I'll make sure to get there for some of the junior events. It's just hard from a financial perspective. I'm enjoying the live streaming. I still have to finish watching the junior men's event as I had choral practice. I watched it when I got home but fell asleep I was so tired and I was sitting in my comfortable recliner! There will be a live stream of some senior practices this morning. TV will not be showing everything (as usual). The first two groups of the Ladies & Men SP events will be live streamed on Skate Canada's Dailymotion channel tomorrow (Friday). They will do the same for the 1st 2 groups of the Ladies and Men's Free Programs on Saturday. Ted wanted everyone to be aware that on Friday the TSN broadcast of the Pairs Short Program will be happening (tape delayed) at the same time as they will be livestreaming the Men's Short Programs so just a head's up. That means as usual the Pairs will get short shift and we will not be able to see the short programs live - at least that's what it sounded like to me. What an interesting and emotionally draining day yesterday!! Now everyone is stuck in Saint John who didn't get out yesterday - with the storm all flights out today are cancelled and some for tomorrow morning as well. Wow Elizabeth, I hope you made it home safely. I didn't know Kevin & Alaine were dating, wow! Perhaps he gave her some tips on jumps. Well, good for her and I'm glad she could put it all together when it mattered most...same for Nam. This time he knows he won it fair & square, not because the champ was taking a year off! It was nice to see Brian congratulating him. Stephen is pretty incredible. I really thought he'd win it all. I feel so sorry for Gabby as I mentioned in my other post, but I'm sure as the article said, her lack of training & competing time were huge factors. I see she has a very supportive mother (not to leave out her father of course) & support team around her and I hope things improve for her. Many people are stranded here including coaches that have other competitions to get to - like Europeans & US Nationals. People who were booked to leave today were (mainly) re-booked for Tuesday as the Monday flights were already full. Now there are cancellations for Monday morning, I hear. It's a very small airport with limited flights and often connections are needed through Halifax or Montreal. January 28, 1pm TSN4 EST; & 10pm TSN2 EST. Last edited by Elizabeth on Sun Jan 20, 2019 6:21 pm, edited 1 time in total. Oh I'm very sorry to hear that! Wow, thanks for all the info. while you are waiting...wow, you're good!